There’s nothing quite like hand feeding a chicken, pulling up a handful of carrots you seeded, weeded, and hand-watered for two months, or watching the sun set over mountains while the farm is full of families picking up their vegetables for the week. These are the simple lessons good soil, clean water, hard work, and fresh food can teach. I’ve spent the last two summers as an apprentice at River Road Neighborhood Farm, one of Garden City Harvest’s four farms, where I’ve been learning by doing. River Road grows food for over 80 households who are members of the farm, and helps stock the kitchen at the Poverello with food each week of the season. That brings me to tomato season. At long last, it arrived—albeit about a month later than usual and much lighter than the motherlode that blessed gardens and farms around Missoula last year. That brings me to tomato season. At long last, it’s here—albeit a month later than usual and much lighter than the motherlode that blessed gardens and farms around Missoula last year. I spent most of the winter and spring eating the tomato soup, sauce, salsa, and frozen fruits I preserved last fall, and most of the summer waiting for tomatoes to come back into season. Desperate for tomatoes, I started making a list of everything I wanted to make out of them this year at the first hint of red on the vines at the beginning of August. Unfortunately, it’s hard to outsmart the whims of nature and August and September have been colder and rainier than anyone would have liked—less than ideal weather for tomatoes. Harvests of tomatoes, peppers, and other hot weather crops have been exercises in frustration at River Road for the past few months. However, harvests are finally topping out above 100 pounds and I have faith that we’ll all end up with enough tomatoes to have more than enough for preservation. 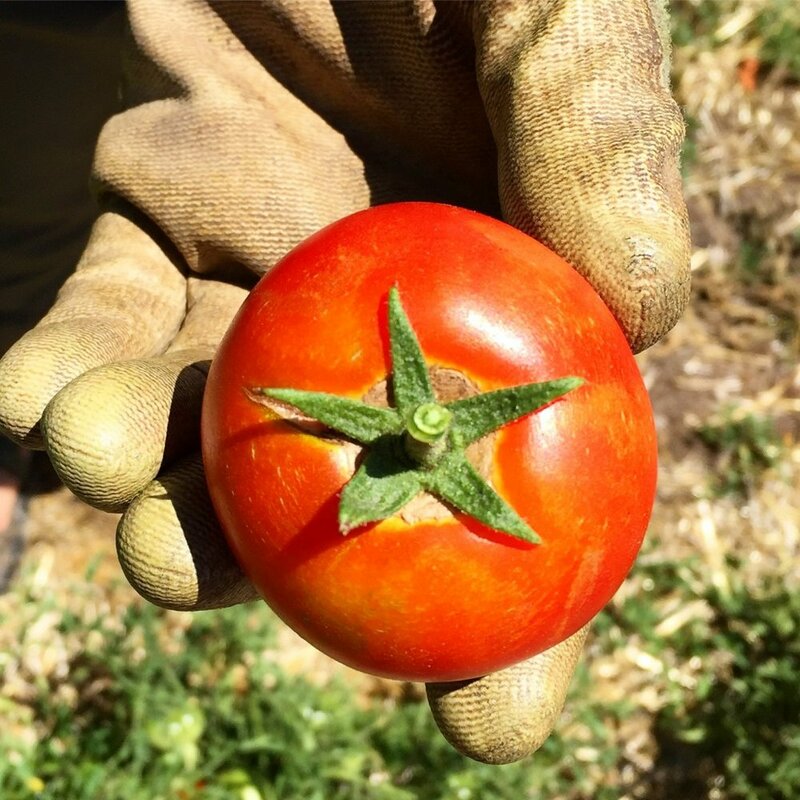 The fleeting inconsistencies of this season reminded me that the best tomatoes are those enjoyed fresh off the vine, standing in the field with juice running down my fingers or starring as a primary flavor in a light dish. One of the dishes on my tomato wish list this year is tomato pie, a recipe I came across in a few southern cooking websites last winter. The version I made was also heavily inspired by an onion pie that my lovely coworker Samantha brought to work one day. Tomato pie is an amazing way to showcase the deep flavors and beautiful colors of heirloom tomatoes—my favorites for this dish were Cherokee Purples and Golden Kings, but any large heirloom would be a good choice. I opted for a slightly healthier version (minus the sour cream and mayonnaise) than the original recipes I came across; a combination of the onion pie recipe and a fantastic recipe for heirloom tomato pie I found on Dig This Chick, a local Missoula blog. With a sunny week ahead of us, there’s still a chance to take advantage of the fresh tomatoes ripening in your gardens and on our farms. Grab a bunch of romas for your soups and sauces and a few lumpy, beautiful heirlooms for this pie. For the crust, take a cup or so of breadcrumbs and mix with 3 tablespoons of melted butter, then press mixture firmly around the pie pan. Mix milk/yogurt, egg, cheese, garlic, onions, and herbs. Pour mixture into pie crust. Layer tomato slices to fill up remainder of pie pan, sprinkling with salt and pepper to taste as you go. 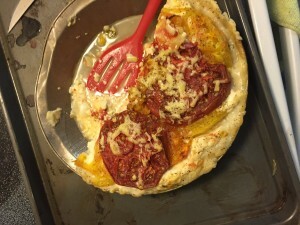 Bake for about an hour, or until the cheesy stuff is nice and bubbly and the tomatoes are juicy and squishy, but not dehydrated or burned. When it comes out of the oven, it will still be pretty watery. Let it sit for an hour at room temperature so it can set up, but it’ll probably taste just as good if you can’t wait that long. Throw some extra fresh basil on top before eating to make it extra tasty. Enjoy the remainder of glorious tomato season. Who knows? If the frost holds off maybe we’ll have a fire sale after all.